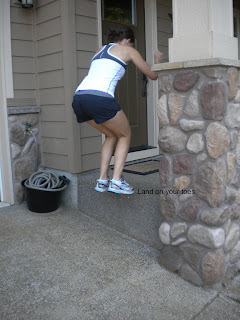 Since the seasons are changing my Hubby and I are trying to get in as many workouts outside these days before we are forced back in to the hot, stuffy gym. 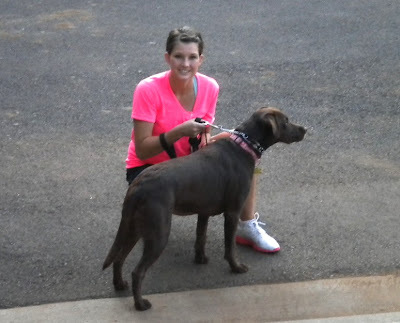 Plus if we workout outside, we can take our dog Kona with us to get her daily exercise. 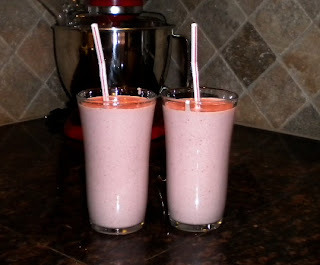 I like to do cross-fit style workouts which are often pretty exhausting. For some reason when I pick out a workout or make up my own work out, I always think that they are going to be easier then they actually turn out to be. I like to "trick" myself and break up the workout in my mind. I will tell my self, "All I have to do is run for five minutes. "﻿ Then once I have ran for five minutes I say, " All I have to do is 20 burpees." 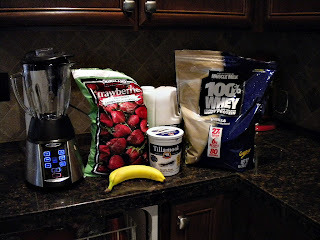 This helps me focus on the specific exercise I am doing and keeps me pushing hard throughout the workout. Good Luck with today's workout! 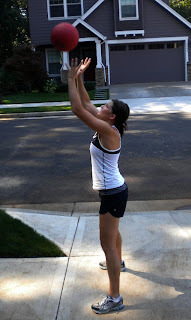 Warm up by running for five minutes followed by stretching. Who doesn't love a Monogram? To see thier initial beautifully displayed? I love them! I saw this in the Pottery Barn catalog, where I got my inspiration for my DIY monogramed doormat. 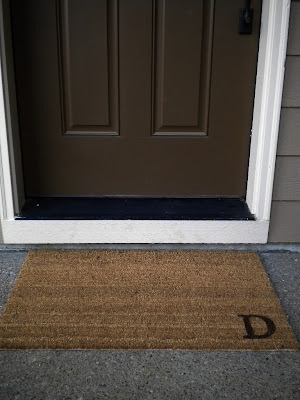 Since I had a new wreath, I thought I also needed a new doormat for my entryway. I loved the simplcity of this rug. I found that it is was difficult to find a plain doormat that did not have a design. Eventually, I found mine at Ikea for $9.99. 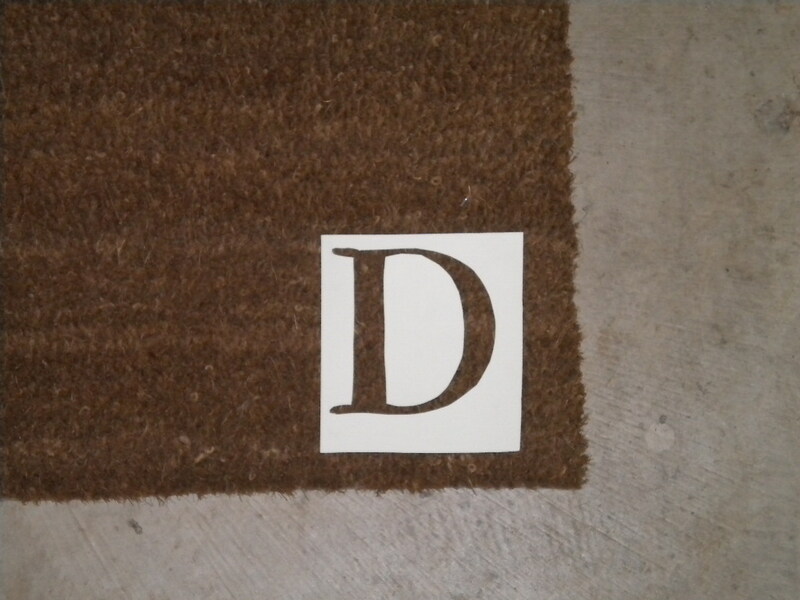 I made my own stencil by printing a "D" on cardsotck and then cutting it out with a craft knife. 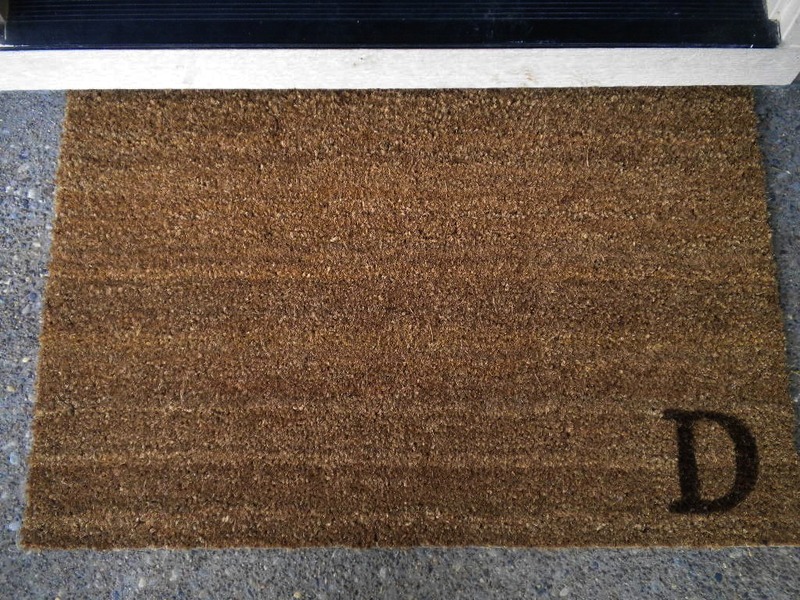 Next, I taped the stencil onto the rug. Originally, my plan was to add some leaves around the edge of the rug and make this my fall rug. 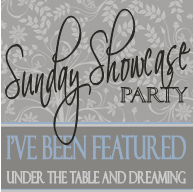 Once I placed my monogram, I loved the simplicity of the rug and decided not to add anything else. If you followed the last couple workouts of the week (WOW), you have probably noticed I am all about quick and efficient workouts. 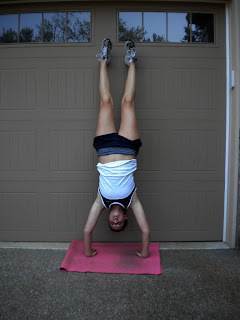 Here is another intense workout you can do anywhere. Good Luck! Warm up by running one mile. Complete this circuit two times. Single-Arm dumbbell swing : like a kettle ball swing but with one arm. Do each arm for 30 seconds. T-Push up: push up position with dumbbell in each hand, go down into push up. Come up and extend one arm up over your head and shoulder so your body creates a "t." Rotate arms. Dumbbell side lunge with touch: side lunge with dumbbells in each hand sink low enough into your lunge that both dumbbells touch the floor. 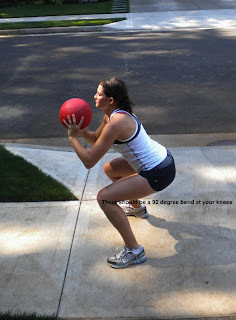 Lunge with rotation: hold a dumbbell at chest height, step forward into lunge. While in lunge rotate your upper body towards your forward leg. Rest for two minutes and complete this circuit a second time. *Remember to go light with your weights. You are not completing sets in this circuit. It is very exhausting completing the same exercise for 60 seconds. Use lighter weights so you can still use correct form. I have seen a few ombre inspired projects lately (here) and was trying to think of a way to incorporate this trend into my fall decore. Why not try to paint my craft pumkins? 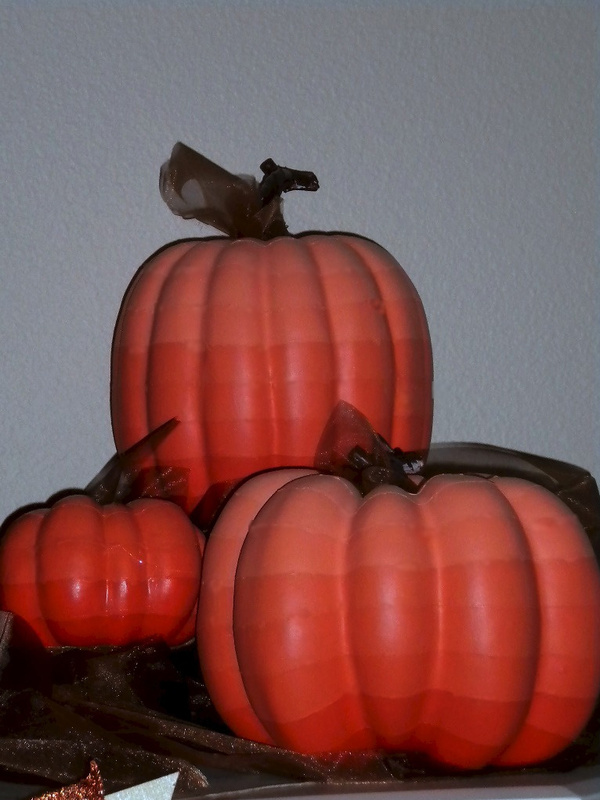 Once I primed my pumpkins and they dried I decided how big I wanted my stripes to be. I choose 3/4 inch. With your pumpkin sitting flat, measure 3/4 inch up from your flat surface. Put your blue painters tape around the pumpkin. 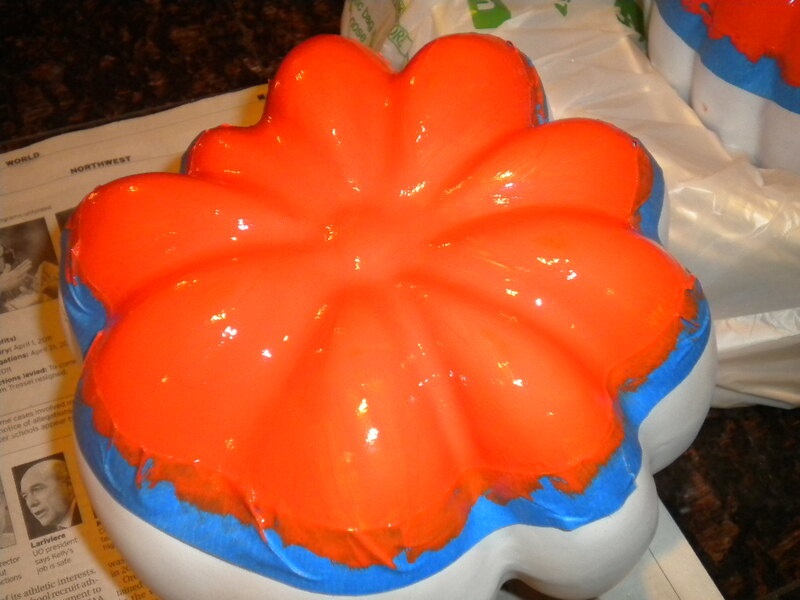 Next, squeeze your entire bottle of orange paint into a cantainer (or whatever color you choose). Paint your first section of the pumpkin. This is where this project gets time consuming. Let the paint completly dry (approx. 30 minutes). While I was waiting for my paint to dry I cleaned and worked on some future projects. 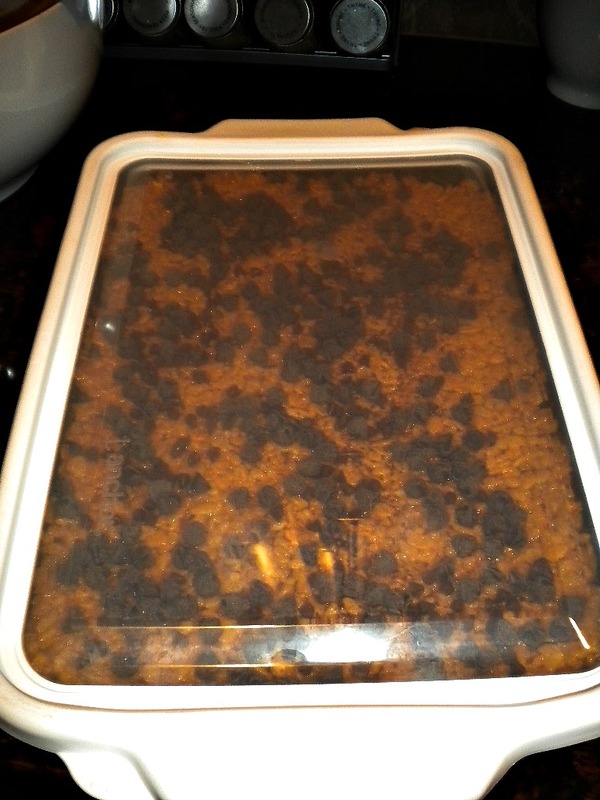 I used a hair dryer to help speed the process because I had the patience of about a two year old. Watching and waiting for paint to dry is very exciting! 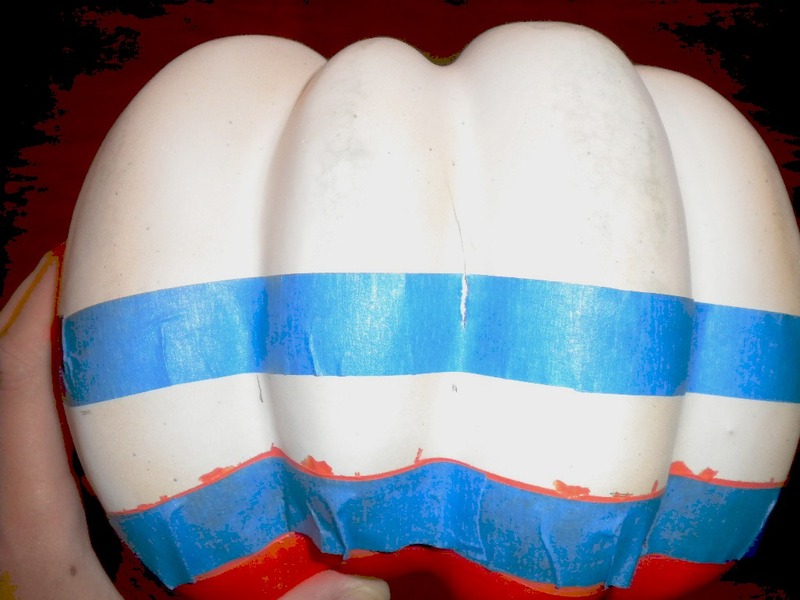 Once your paint is dry remove the blue tape. Put blue tape over the line that just finished drying, leaving a little overlap so no white shows through. 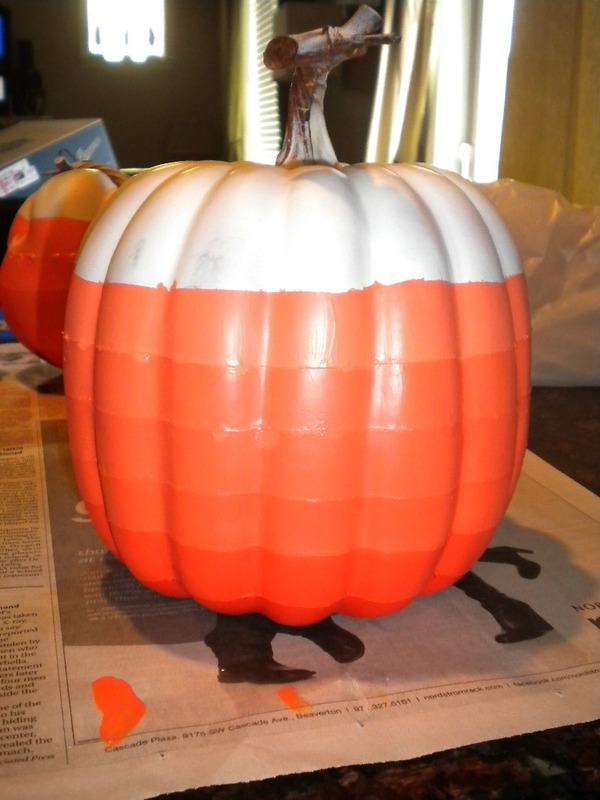 Measure 3/4 inch from your last painted row and tape around your pumpkin again. You will now have two rows of blue tape to paint your next row between. Try to get your tape as tight as possible. The surface of the pumpkin made it difficult. In the end, it really does not matter beacause you are going to be painting over it with your next row. Plus with the uneven surface of the pumpkin the blemishes are difficult to see unless you standing right next to the pumpkin. When I finally finished painting my rows, I painted the stem of the pumpkin with some leftover brown paint. I am pleased with the finished project, but this project takes time and patience. 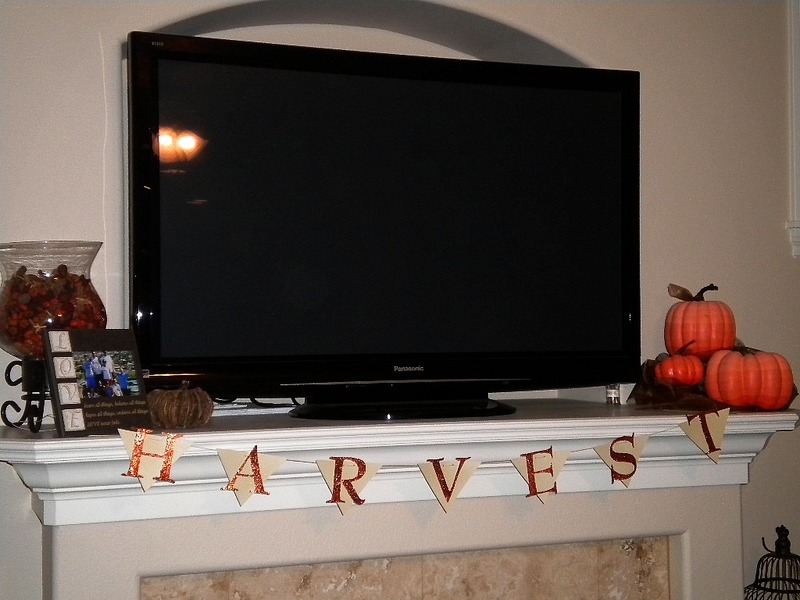 This is the first year that I am actually decorating for fall. 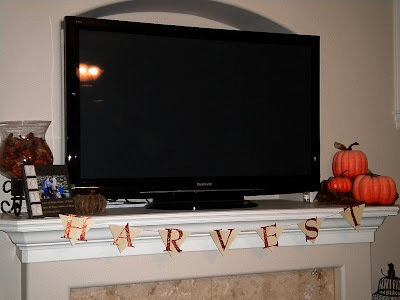 Last year we were so new in our home that I hardly had any normal decorations; so I did not want to spend the time or money on seasonal decorations. 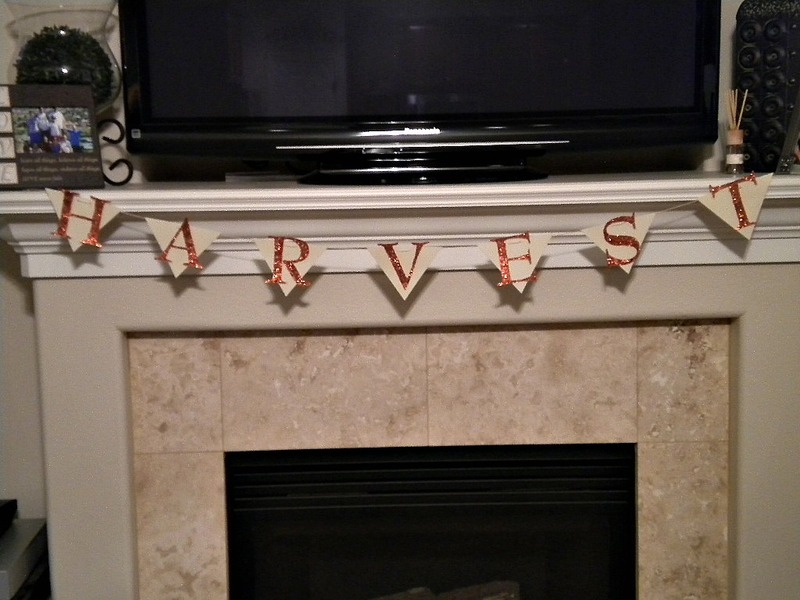 This year I am ready to decorate for fall, in full force. I started with my wreath and the next step was making something for my mantel. 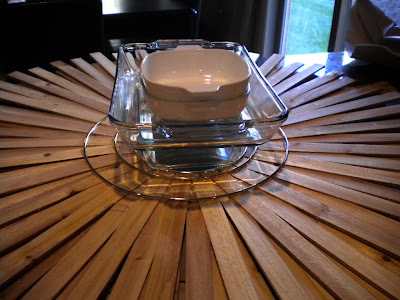 I like this project because it is simple and if you are into making crafts, you probably already have all these supplies in your crafting room or closet! I taped my prints over cardstock to cut my letters out. I was using orange glitter, so I also used orange cardstock so no white would show through my glitter. 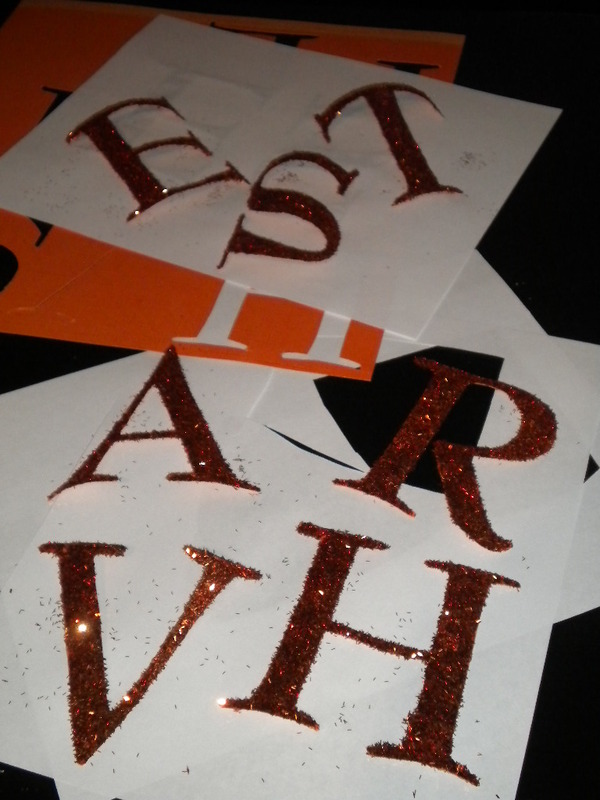 Once your letters are cut out start mod-podging and glittering your letters. 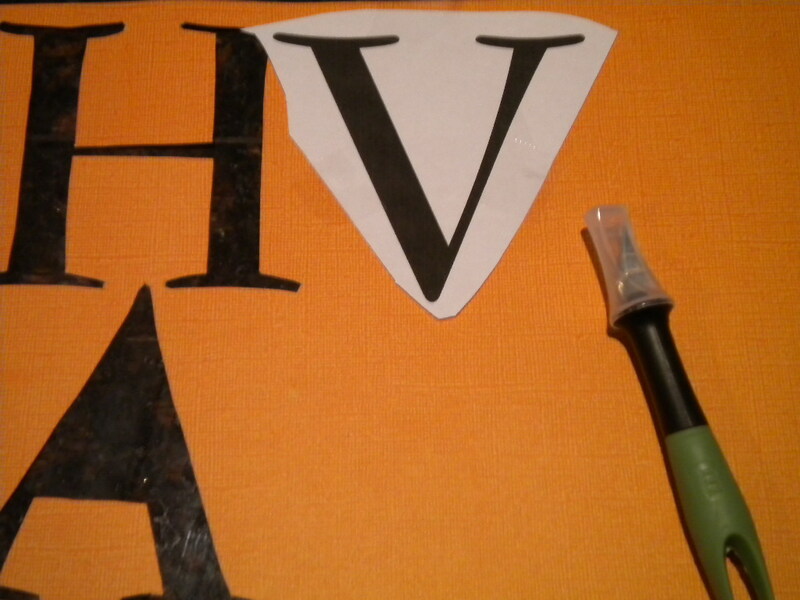 I let my letters dry while I cut out triangles to adhere to the back of my letters. 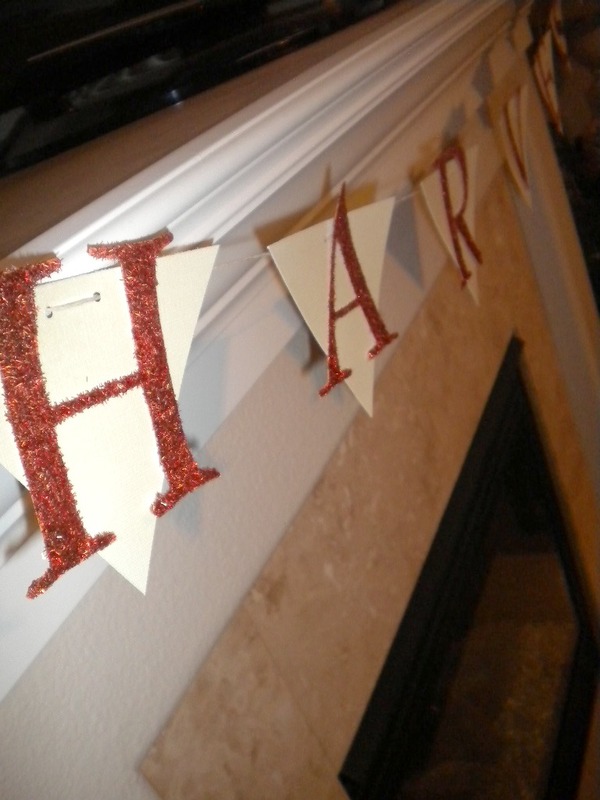 Using a small circular hole punch I made holes for the string of my garland. 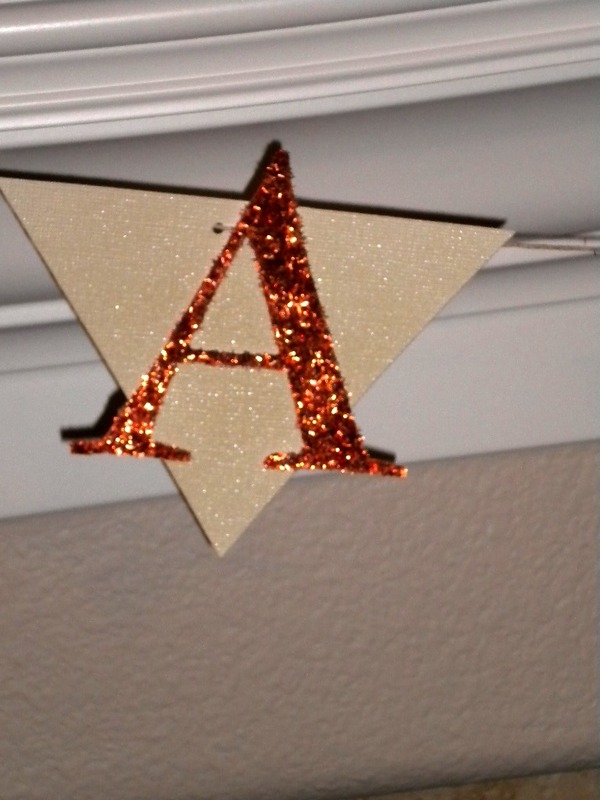 I strung my triangles on my hemp string and used glue dots to adhere my triangles and letters together. 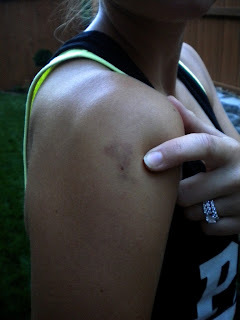 A lot of my workout's come from Cross-fit. Cross-fit is a type of exercise that includes cardio and strength training in quick circuits giving you a full body workout. The best part is that Cross-fit.com and many other individual gyms, that practice Cross-fit, post daily workouts online. There are tons of places to get great workouts for free. This is one of the cross-fit workouts I tweaked to fit my needs using the equipment available at my gym. Run 1 mile to warm up. Lastly, stretch to cool down. 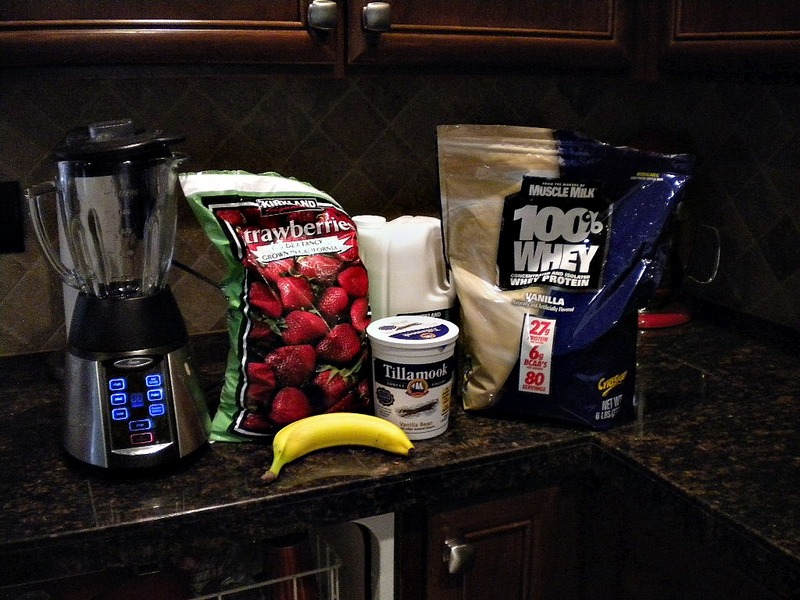 I was in and out of the gym in 37 minutes completing this workout from start to finish. 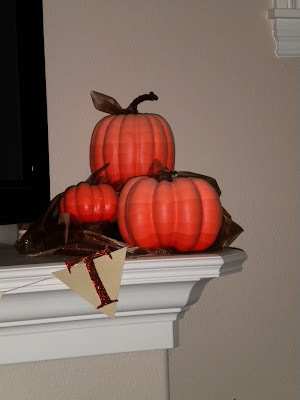 It's getting to be that time..... time to decorate for fall. For every season I make a wreath. I'm not sure why, because by the time I'm done buying the supplies for my wreaths they seem to never be as inexpensive as I expected. 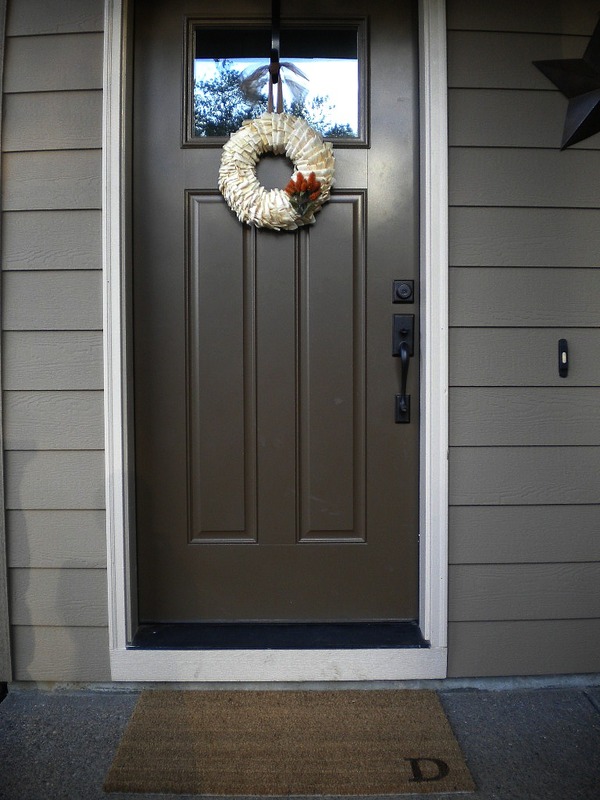 However, I love to craft, I love that nobody else has the same wreath, and I love it when someone comes over and asks where I got my wreath. 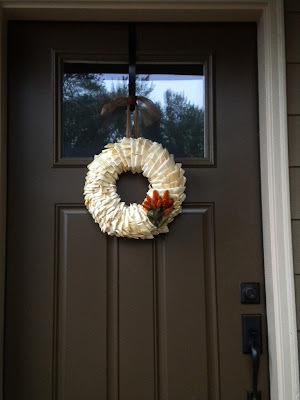 I wanted to make a wreath that would last me through the whole fall season. 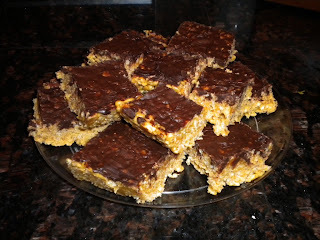 Not just Halloween or Thanksgiving. I came up with a wreath made from dried corn husks. 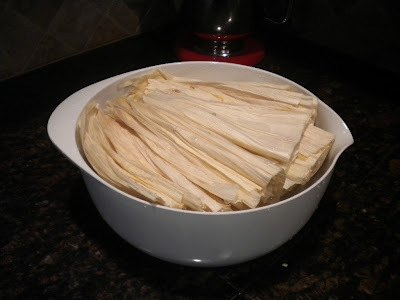 Start by taking your corn husks and placing them in a large bowl filled with water. 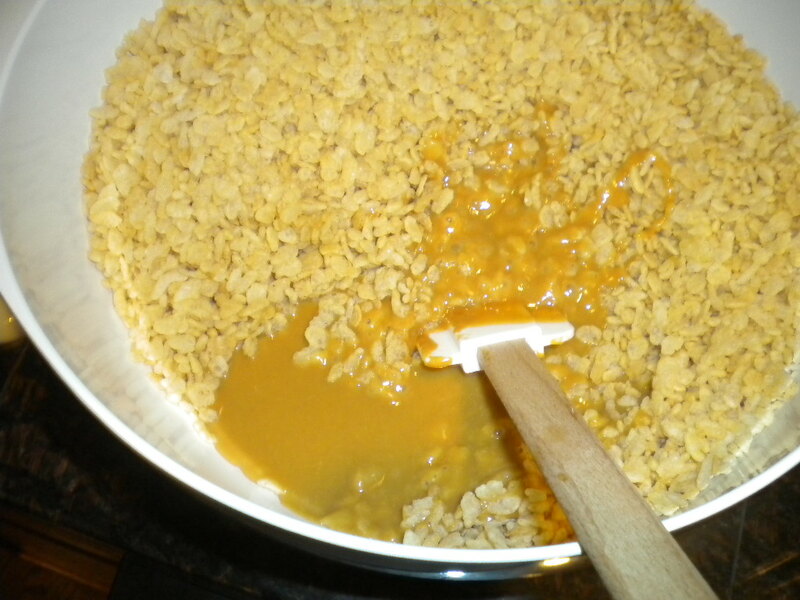 Soak for about 10 minutes. 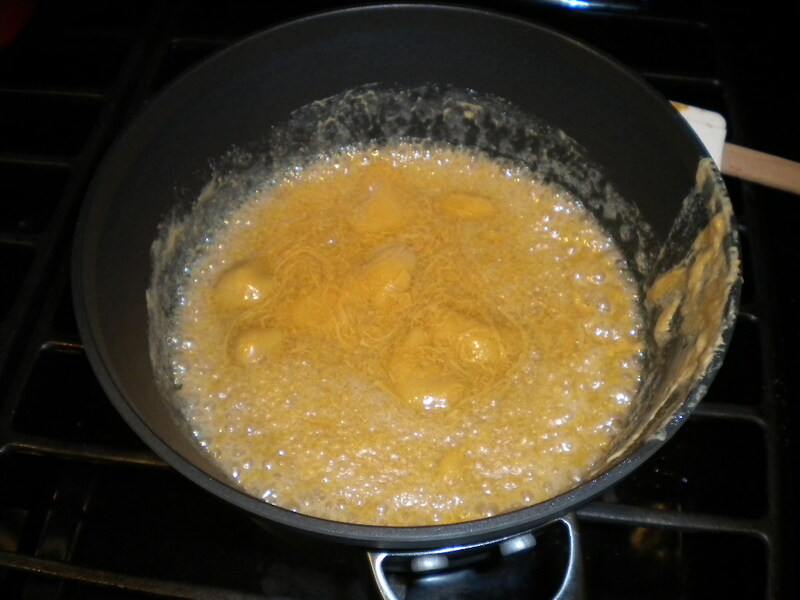 By soaking the corn husk you are making it more manageable to work with. ﻿Take your corn husk and cut off about 2 inches from the bottom. This is the narrow part of the husk. 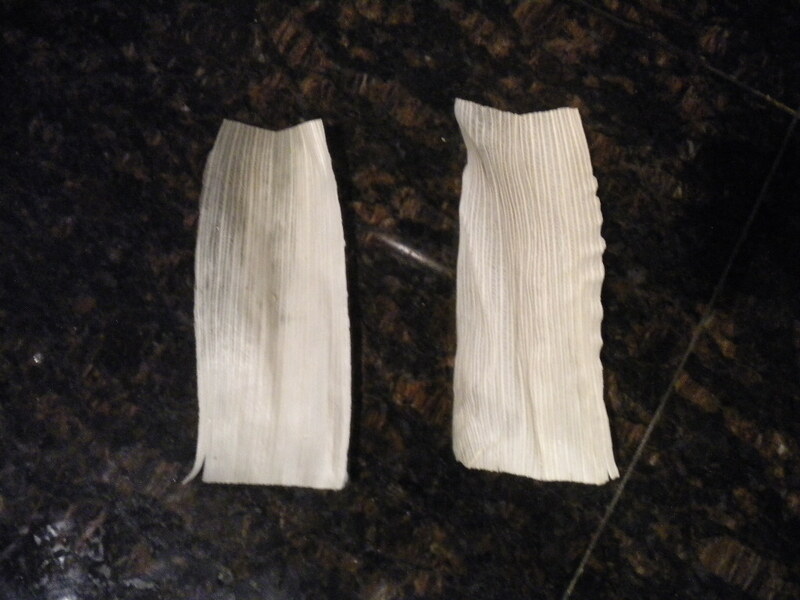 Next, tear the corn husk into about 1.5 inch sections. ﻿This is what your pieces of corn husk should look like when you are ready to start pinning them around your wreath. 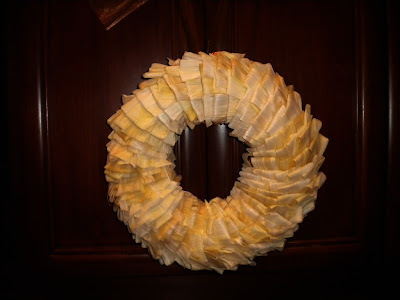 Start pinning from the inside of the wreath. Each row will have 5-6 pieces. 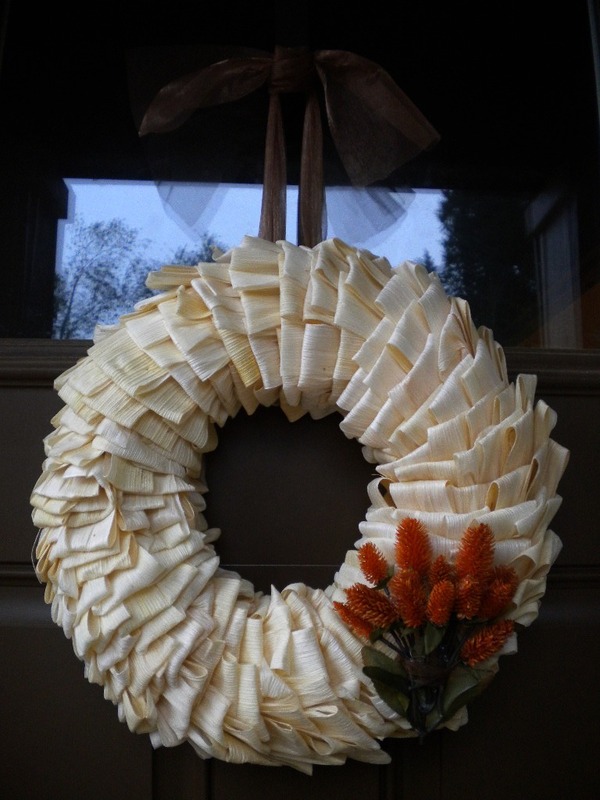 Overlap the corn husks as you make your way from the inside to the outside of the wreath. Continue this process for the next row. Overlap the rows so you cannot see the pins. If you want, you can leave more space between your rows then I did . I like my wreaths to be very full so I tightly overlapped my rows. 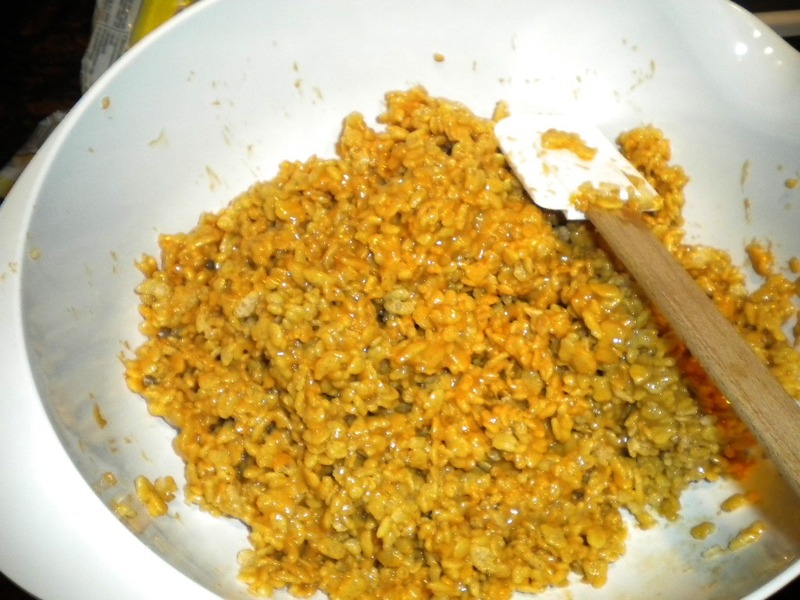 Keep pinning all the way around. At some point add in your ribbon for hanging. 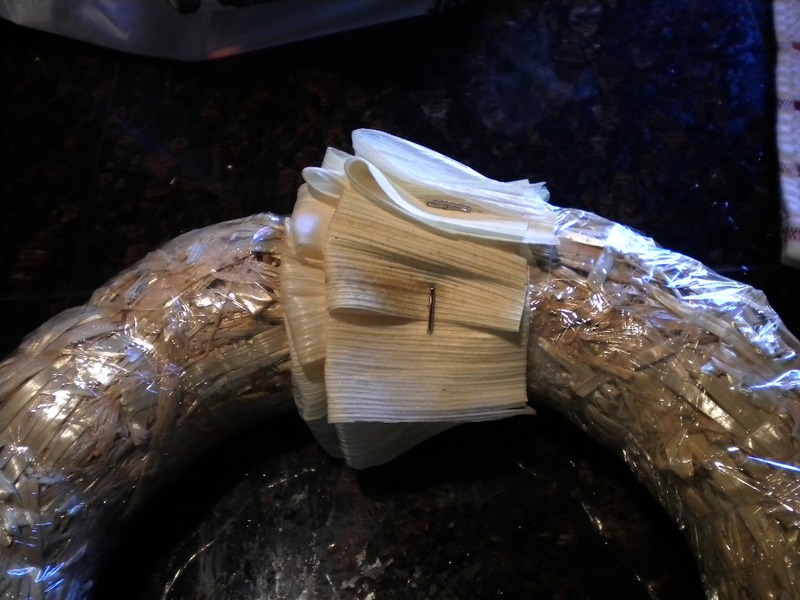 I tied mine around the wreath and kept pinning the corn husk over the ribbon. 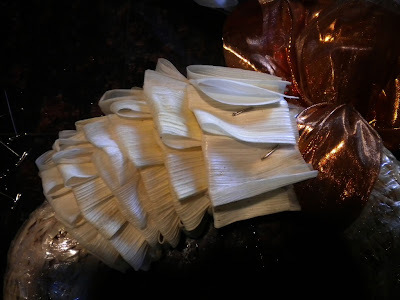 Once I finished pinning all the corn husks, I realized I needed to add a little color. I arranged a few flowers to add to the wreath. Once I had the flowers arranged how I wanted them, I glued them on with hot glue. 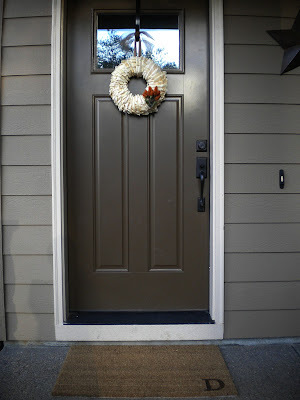 The end result was just what I was looking for, an elegant looking fall themed wreath that will last the entire season. My husband and I just finished a major overhaul to our backyard (pictures to come soon). 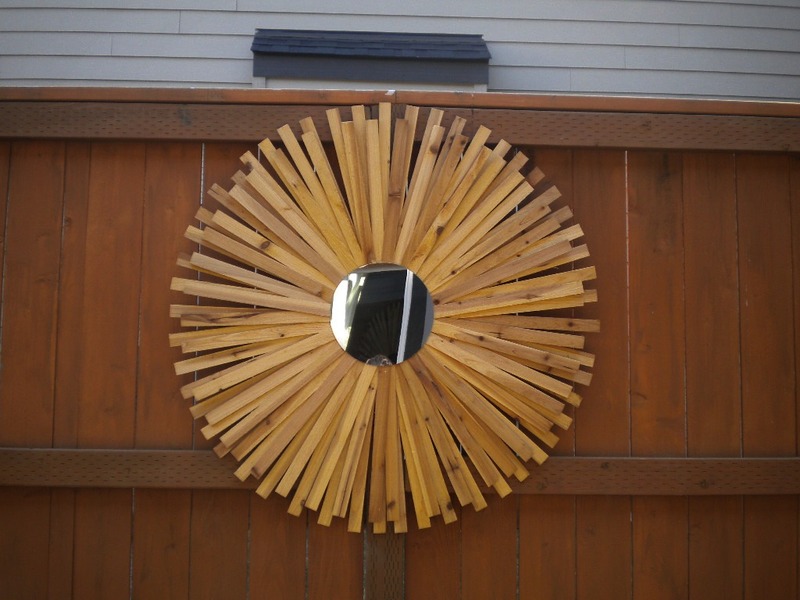 One of the finishing touches to complete this project was a piece of artwork to hang on our fence. 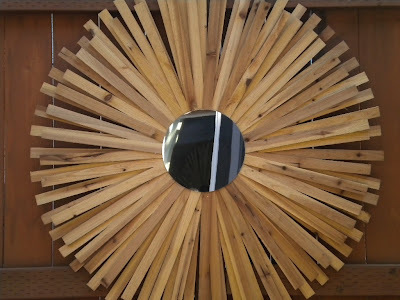 All the images of Sunburst Mirrors I saw posted everywhere in the "blog" world started to flood my imagination. The only problem was that I wanted my project to be somewhat sustainable to changes in the weather. Check out the tutorial on my weatherprooff sunburst mirror. 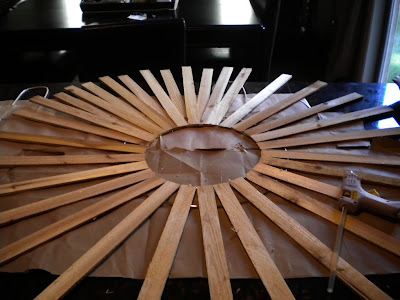 ﻿Lay your two largest craft rings (14 and 10 inch) down and line up a few wood shims to get an idea of how they will line up before you start gluing like crazy! The skinny side of the wood shim will be towards the inside and the bottom of the shim will line up with your inner ring (10 inch ring). 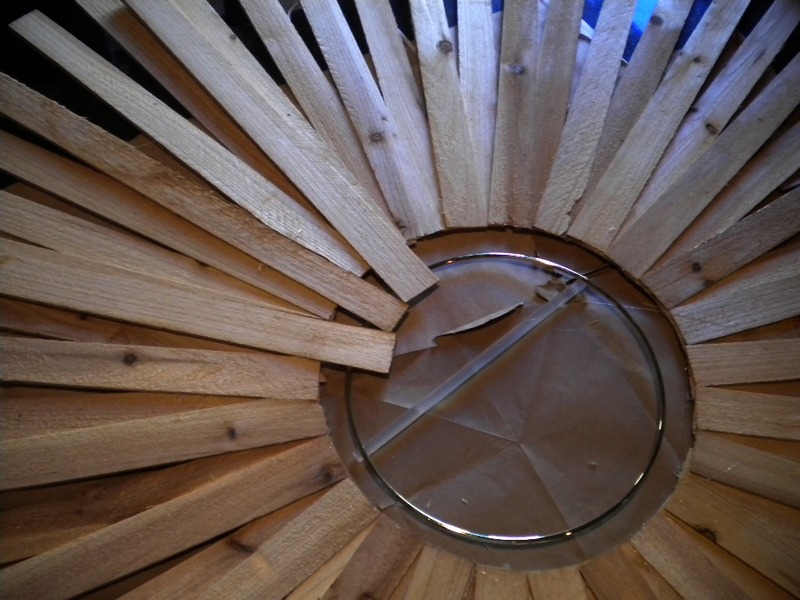 The 10 inch ring will be your guide for where to glue the first row of wood shims. 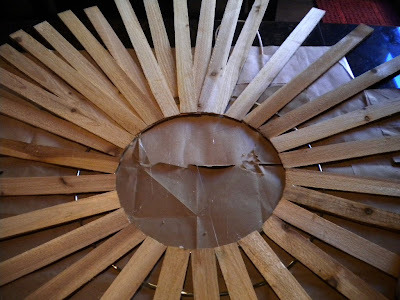 I used a hot glue gun with glue that was made to adhere to wood and metal. Once you finish the first row star﻿t gluing a second row on top the row you just finished. On this row you will lay the shims between the gaps of the first row you glued. The top left hand side of the picture above shows the second row being glued down. Now it is time to add your third craft ring (8inch). Just place the craft ring in the middle and start following the same pattern you did on the first two rows. Skinny side in and glue down the wood shims to both the craft ring and the base of your already finished first two rows﻿. 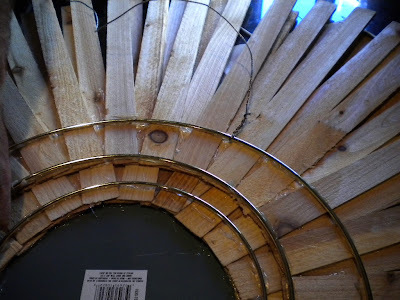 I did not line up the bottom of the wood shims along the craft ring on this row; I wanted a little more dimension between the layers of the wood shims. Complete your last and final row of wood shims. 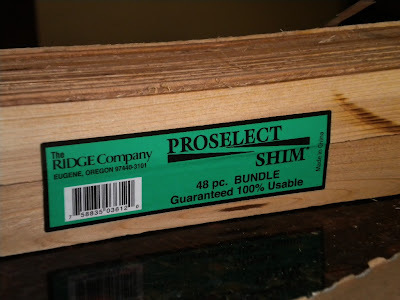 You should have four layers of shims total in the two different sections. Once all the rows are finished, flip over your artwork, take a sneak peak and then glue on your mirror. 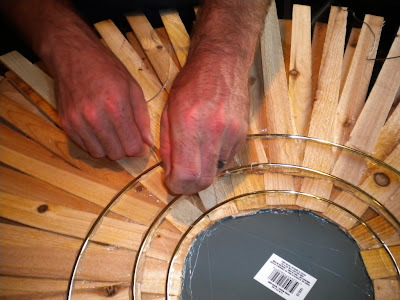 Use Gorilla Glue to glue down the mirror. 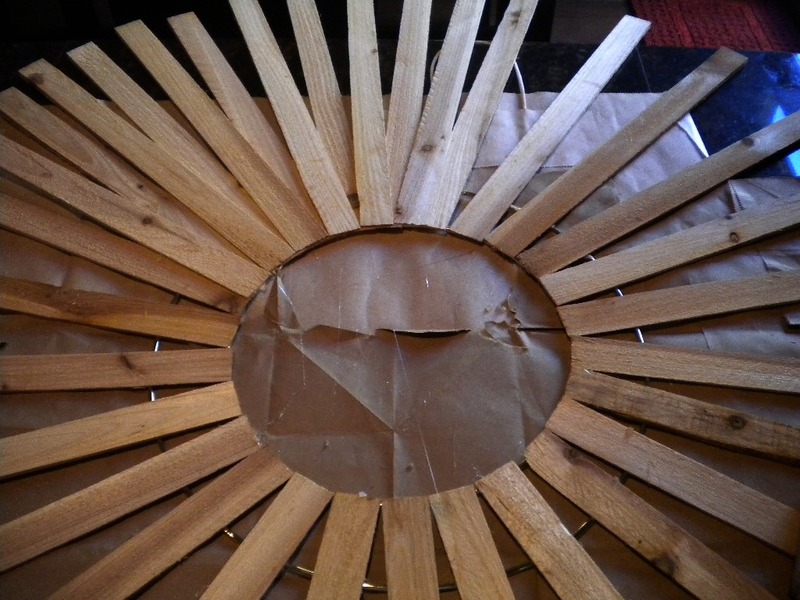 Place something heavy over the mirror and wood shims then walk away for 2-3 hours to allow the glue to adhere. At this point, I also added Gorilla Glue in the gaps between the metal craft rings and the wood shims. 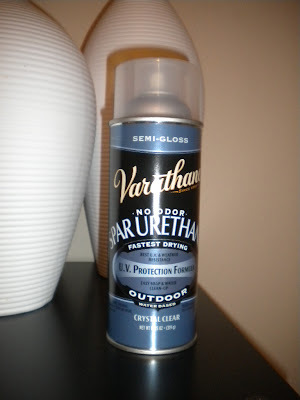 I figured the more glue the better! To hang the mirror we simply slipped wire underneath the craft ring in two different places and twisted the ends closed. 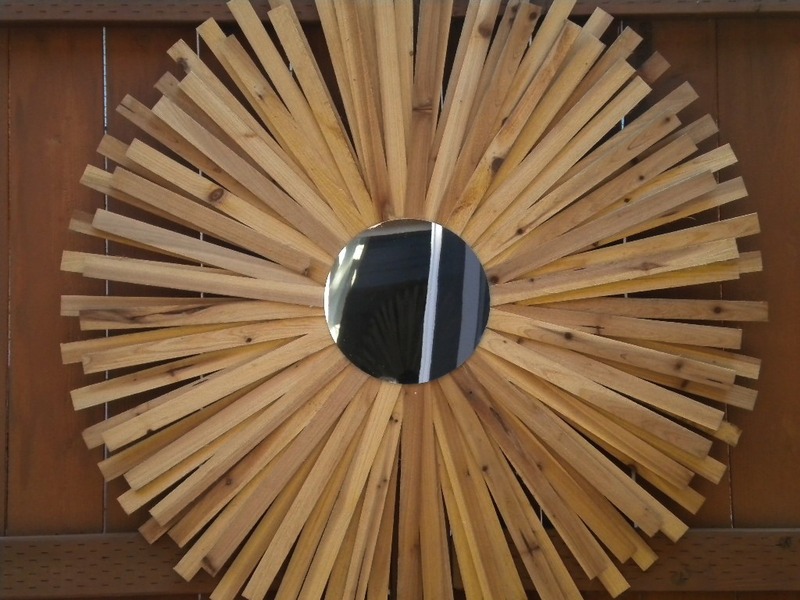 If you don't need your sunburst mirror to be waterproof you are ready to hang your new artwork!